To shooters, collectors, and historians, there’s only one serious candidate for the title of the World’s Greatest Pistol – the Model 1911. Now, just in time for its hundredth anniversary, comes Gun Digest Shooter’s Guide to the 1911. Written by renowned 1911 authority Robert K. Campbell, Gun Digest Shooter’s Guide to the 1911 is the definitive shooter’s guide to John M. Browning’s most famous creation. From tips, tricks and techniques for getting the most out of your 1911 to real-world evaluations of more than 50 different models of the 1911, you’ll find it in Gun Digest Shooter’s Guide to the 1911. Robert K. Campbell has a background of over twenty years in law enforcement as a trainer, weapons tester, and a street cop and is one of the most prolific writers today on the subject of fighting weapons. He has been published in most of the better publications dealing with fighting firearms and edged weapons including American Rifleman and Guns & Ammo. He is also a contributing writer for Gunblast.com, the online magazine. A previous book from Robert, The Gun Digest Book of Personal Protection & Home Defense, is available from Gun Digest Books. 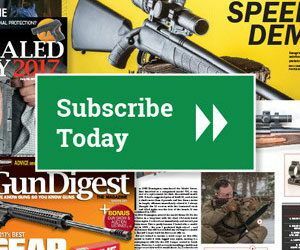 Click here to get your copy of Gun Digest Shooter’s Guide to the 1911. ❰Book Giveaway: What’s the Greatest .22 Rifle of All Time?